The demise of the North Sea doesn’t necessarily mean the end of Norway’s petroleum era—far from it. Still, despite significant reserves in the Barents Sea, Norway is about to embark upon a long period of structural decline as its benchmark fields inch closer to depletion and its reserves taper before our very eyes. The average Norwegian might not even perceive the difference between an oil-rich Norway and one that is past its prime. The nation’s massive external and fiscal net position, as well as its complete energy independence thanks to hydropower, allows for great flexibility regarding future policies. Yet its oil workers must prepare for a future that is much more Arctic, smaller-scale and gas-based. There’s ample evidence to conclude that all the sweet spots of Norway’s continental shelf have been found. The latest shelf licensing round (24) elicited a weak response, with only 11 companies applying for production licenses. There was plenty to bid for—102 blocks were up for grabs (never before did the Norwegian Petroleum Directorate offer so much, with an overwhelming majority of them in the Barents Sea), but due to their remoteness from formations deemed to be the most hydrocarbon-rich, bidders were only half as numerous as they were during the previous licensing round in 2015. Other factors also contributed, including ongoing legal disputes whether drilling in the Arctic breaches Point 112 of Norway’s constitution (“natural resources should be managed based on long-term considerations, safeguarded for future generations”) and questions over the admissibility of drilling in Russia-disputed Svalbard waters (10 blocks) might have scared away an investor or two. Graph 1. Norway’s Leading Oil Fields Production 1971-2016. The vicissitudes of oil production have also soured Norway’s outlook for 2017. Its producers have underperformed this year (Jan-Oct data indicate an average of 1.605 mbpd against NPD’s forecast of 1.621 mbpd). This was largely due to Goliat’s travails, the first Norwegian field in the Barents Sea to be brought on-stream. Goliat was shut down for a month in September 2017 for maintenance works; however, October witnessed another unplanned layoff as Norwegian authorities ordered ENI (the operator) to halt activities in view of serious deficiencies in the platform’s electrical system. Plagued by false alarms and power outages, the platform’s future hung thick in the air as Norwegian authorities conducted a thorough analysis before production could be restarted once again, for the eighth time since it started producing in early 2016. Graph 2. Norway’s Oil Production in 2011-2017. Taking into account the doubling of the Barents Sea reserves estimate, Norway’s continental shelf still holds up to 12.4 BBbl of undiscovered oil reserves. This means that two-thirds of Norway’s untapped oil is located in the Barents Sea, which is likely to become subject to much more meticulous public scrutiny. Claims by Greenpeace and other campaigners that offshore Arctic drilling breaches the Norwegian constitution is a risky one for the State—almost 200 000 jobs are at stake if the court acknowledges even partially the legality of the environmentalists’ demands. All the more so now that pretty much all new promising oil projects are located in the northernmost Barents Sea. After 2001, Norwegian oil output recorded 12 consecutive years of falling production. The current phase might best be described as a lull before the (presumably) last long-term production increase in its history, expected to happen in the early 2020s. Much will depend on the two “Johans” Norway will bring online in the early 2020s: Johan Sverdrup (recoverable reserves worth 2-3 BBbl) and Johan Castberg (0.5 BBbl). It’s by no means an easy decision. The development of Johan Castberg—as of today the largest field in Norway’s Barents Sea zone—was given priority over smaller projects. Johan Sverdrup’s first-phase production will start in late 2019, with full nameplate capacity (660 000 barrels per day) expected to be reached by 2022. Coupled with Castberg’s 200,000 bpd peak output, the two fields alone will account for roughly half of Norway’s production by 2022. Graph 3. 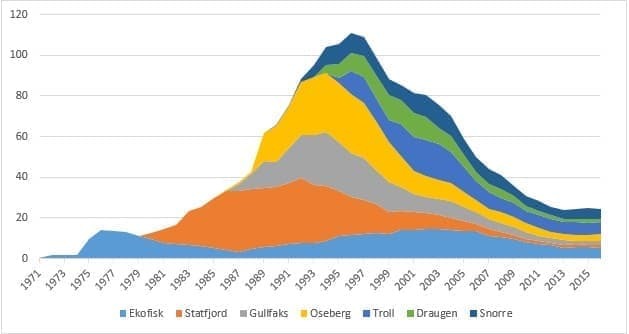 Norway’s oil and gas production 1970-2021. 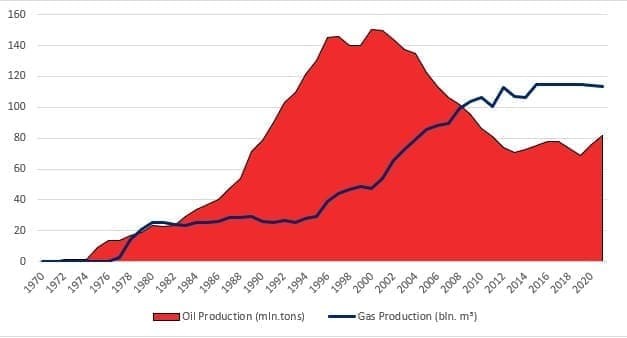 Interestingly enough, gas’ peak production is yet to come in Norway (oil’s peak plateau was reached in 1999-2000). 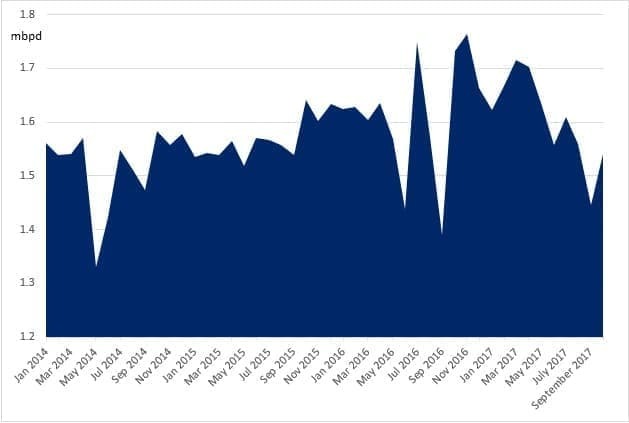 Since most oil fields on the Norwegian Continental Shelf are gas-bearing and recent years have seen steady inflows from new projects (Skirne, the major Snøhvit, Gjøa, Gina Krog and now Maria), gas output has been on a relatively stable plateau of 115 BCm per year. 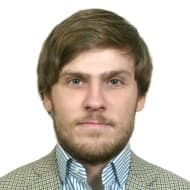 Approximately 40 percent of hydrocarbon reserves found in the Barents Sea are gaseous, therefore one might expect a gradual migration of development towards the Arctic, similar to what happened within the oil sector. For oil itself, the next decade will represent the beginning of an end, which, albeit gradual, seems inevitable. As a consequence, Norway’s share of the global oil market will decline from the current two percent and drift closer to one percent in the 2020s. Oil prices cannot sustain above $40 making it unviable for new blocks. Demand from India, China, Japan, USA for 2017 is almost flat and may decline for 2018. As against, Gulf countries and Venezuela will be forced to sell more to sustain its infra and imported military hardware. Russia, though insulated by oil-treaty with China, will be forced to sell more to Europe to sustain itself. Time has come to move from oil today.